Line a 13-x-9-inch baking pan with graham cracker squares. Melt the butter in saucepan and add sugar. In a separate bowl, whisk together the egg and milk. Slowly and continuously stir into the butter mixture. Bring to a boil, stirring constantly (to keep the egg from scrambling). Remove from heat. 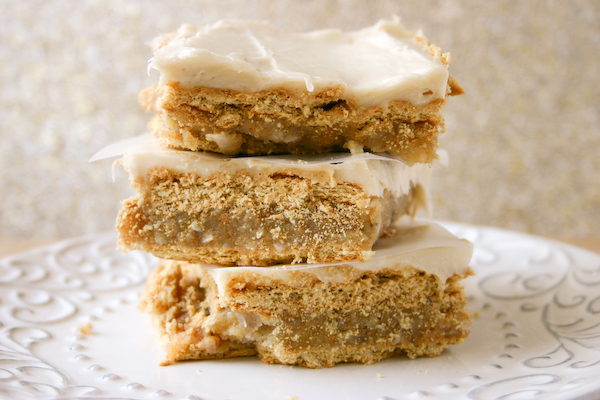 Stir in nuts, coconut, and crushed graham crackers. Pour over graham cracker squares and spread evenly using a spatula. Top with another layer of graham cracker squares, pressing them down gently into the filling. For the cream cheese frosting, place cream cheese in a bowl and soften using a rubber spatula. Gradually add butter and beat together until smooth and creamy. Sift in powdered sugar and continue beating until smooth. Add vanilla and stir to combine. Spread frosting over graham cracker bars evenly. Or not. No big deal.